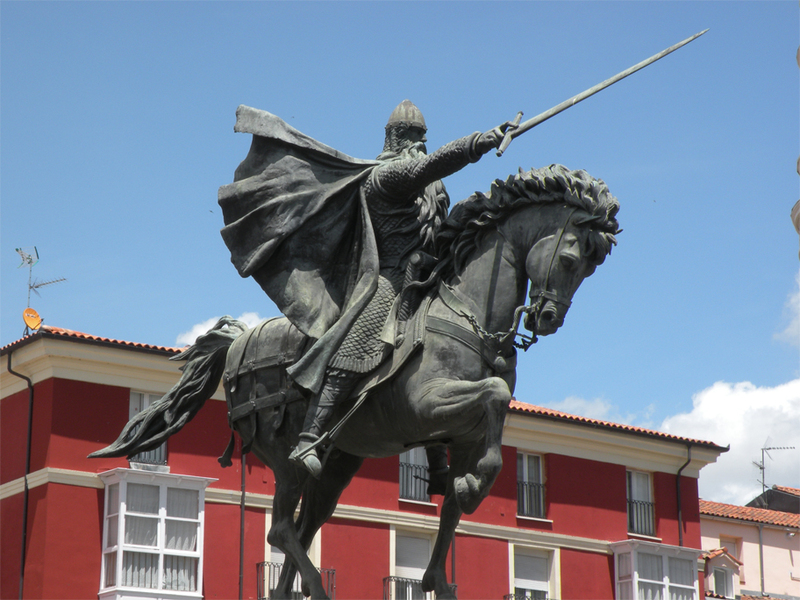 Perhaps no other legendary figure rouses the Spanish consciousness quite like the man known as El Cid. Widely considered a national hero, Rodrigo Díaz de Vivar was born in 1043 as a member of the minor nobility, in a small town six miles north of Burgos. Raised and educated in the court of Ferdinand I, “Emperor of all Spain”, he rose to prominence as commander and royal standard-bearer for the king’s oldest son and heir, Sancho II. A loyal warrior of the Kingdom of Castile, El Cid took part in successful campaigns against Moorish lands to the south, and the neighbouring kingdoms of Navarre and Aragon. When Ferdinand died, his realm was divided between his three sons; Castile was given to Sancho, León to the middle son Alfonso, and Galicia to the youngest, García. The results proved disastrous; Christian Spain was soon entangled in a bloody family feud. The two eldest brothers joined forces to invade Galicia, ousting García, before turning on each other. Led by El Cid, the Castilian army emerged victorious at the Battle of Golpejera, taking Alfonso prisoner and driving him from the Leonese throne. Sancho’s next step was laying siege to Zamora, then held by his sister Urraca. Together Urraca and Alfonso made a secret pact, and as Sancho’s army camped outside the city walls, the heirless king was assassinated in his tent by a local nobleman. 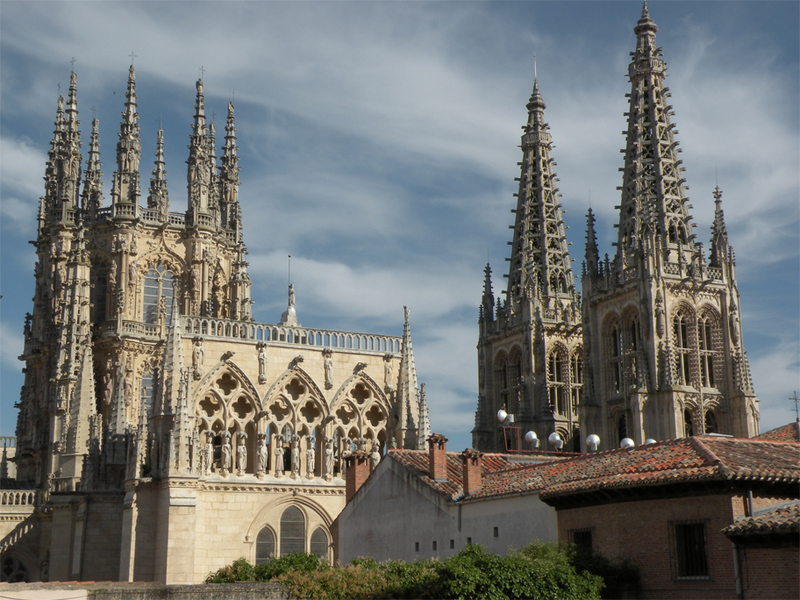 Alfonso returned as the sole ruler of both Castile and León, but the court of Burgos was suspicious of his involvement in the affair. 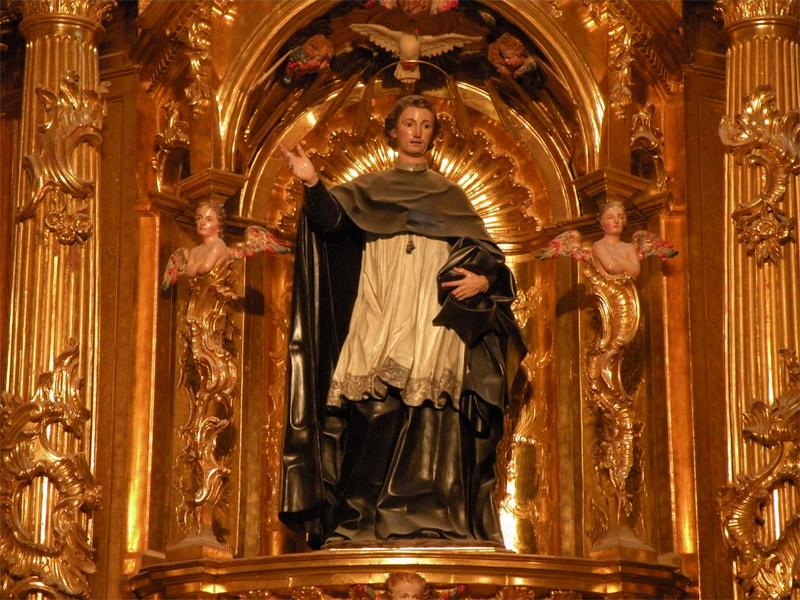 Legend has it that El Cid, with the Castilian nobility behind him, forced the new king to swear a public oath on the relics of a saint, proving that he did not play a part in Sancho’s death. After more than eight years of service to Alfonso, El Cid was accused of stealing the king’s money, stripped of his status and ordered into exile. Then they shook out the bridle rein further to ride afar. 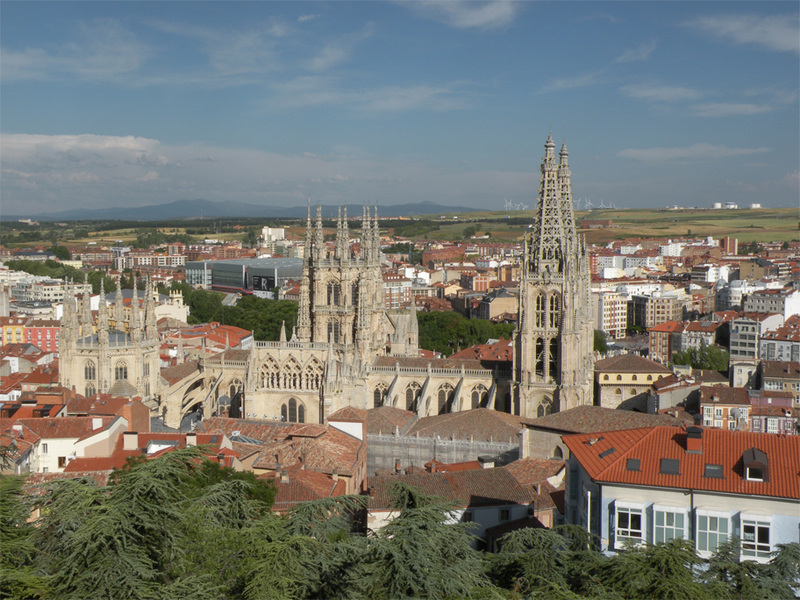 The Burgos of today bears little resemblance to the one known to El Cid. 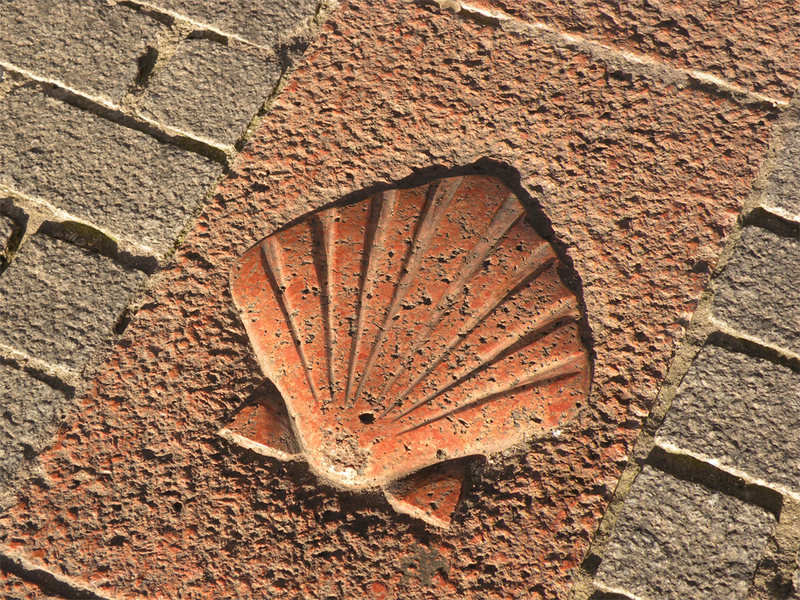 What is now a city of 180,000 was then a small settlement of only 2,000 inhabitants, a growing market town and political centre on the Camino de Santiago. 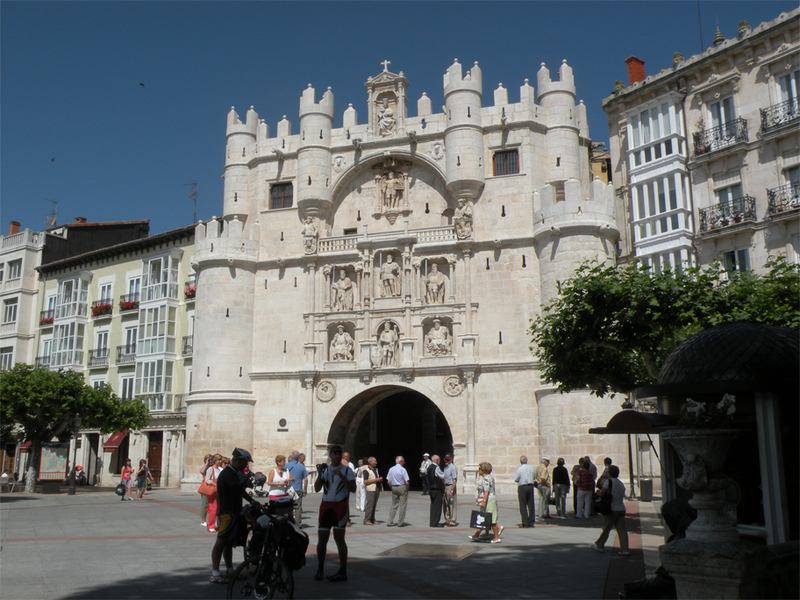 According to the Cantar de mio Cid, Rodrigo Díaz left the city through the Puerta de Santa María, a gateway since rebuilt in the 14th century, which still stands between the old town and the Arlanzón River. 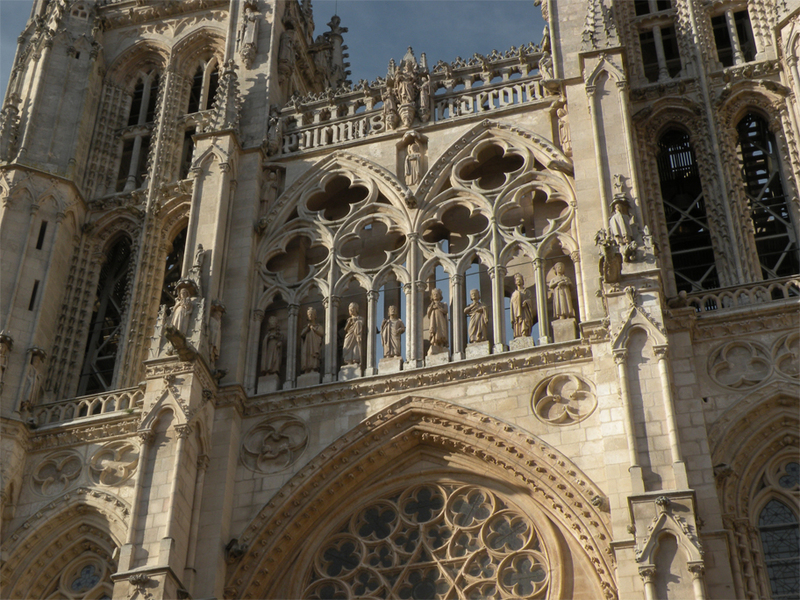 Before doing so he knelt in prayer at the Church of St. Mary, on a site now occupied by the UNESCO-listed Gothic cathedral. El Cid’s popular title was borrowed from the Arabic sayyid, or “Lord”, and he was highly respected by both Moor and Christian alike. While in exile, El Cid found a new master in al-Mutamin, the Moorish ruler of Zaragoza, and his successor Al-Mustain II. Six years of loyal service followed, with a string of military successes against his rivals. Rodrigo Díaz was eventually recalled by Alfonso after the Battle of Sagrajas (1086), in which the Castilian army was soundly defeated by Almoravid Berbers from North Africa. Although he remained loyal to Alfonso in name, El Cid began a concerted effort to conquer the Moorish kingdom of Valencia. 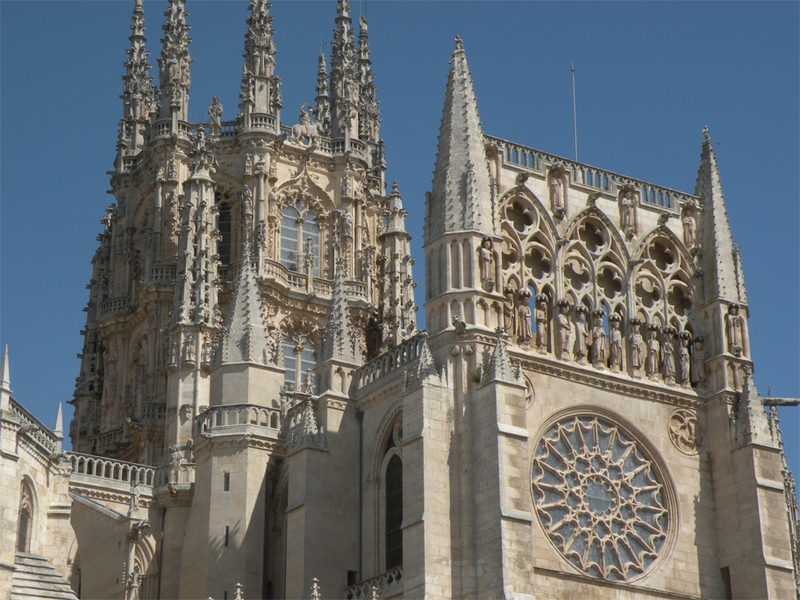 A 19-month siege of the city ensued, and El Cid became the independent prince of a pluralistic state – where Christian and Muslim served alongside in the army and in administrative positions. The dream was short-lived, however, and after five years Rodrigo Díaz died during a siege brought on by the Almoravids. 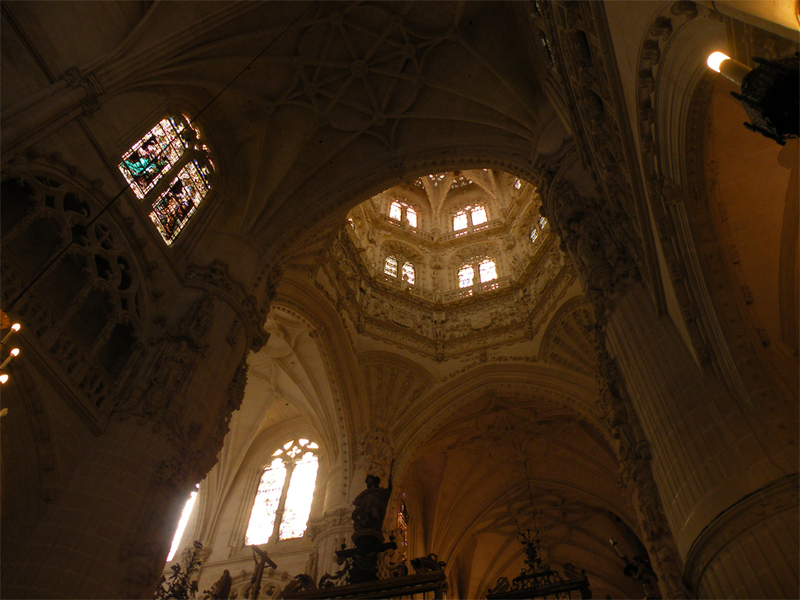 His wife, Doña Jimena Díaz, cousin of King Alfonso, fled back to Burgos two years later, with the body of her departed husband. 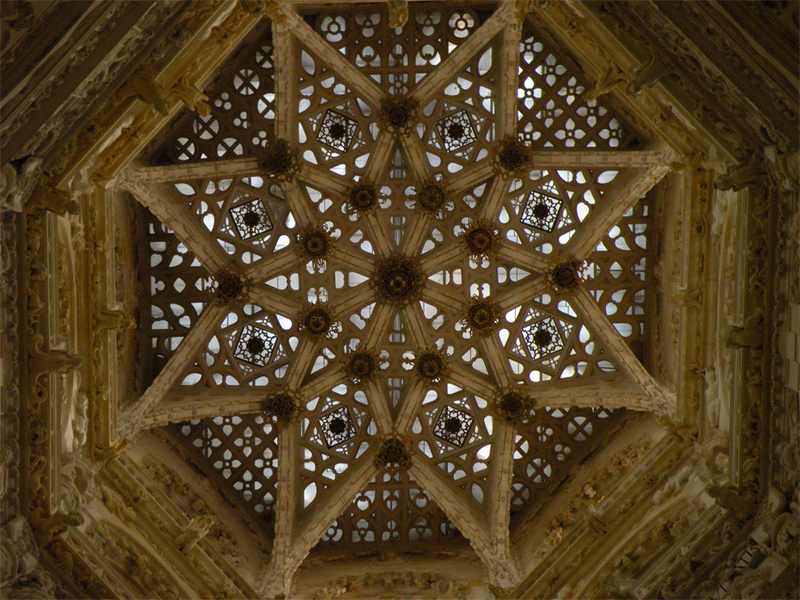 Today both Rodrigo and Jimena are buried at the crossing of the cathedral, beneath the glorious, lace-like stonework of an octagonal lantern. 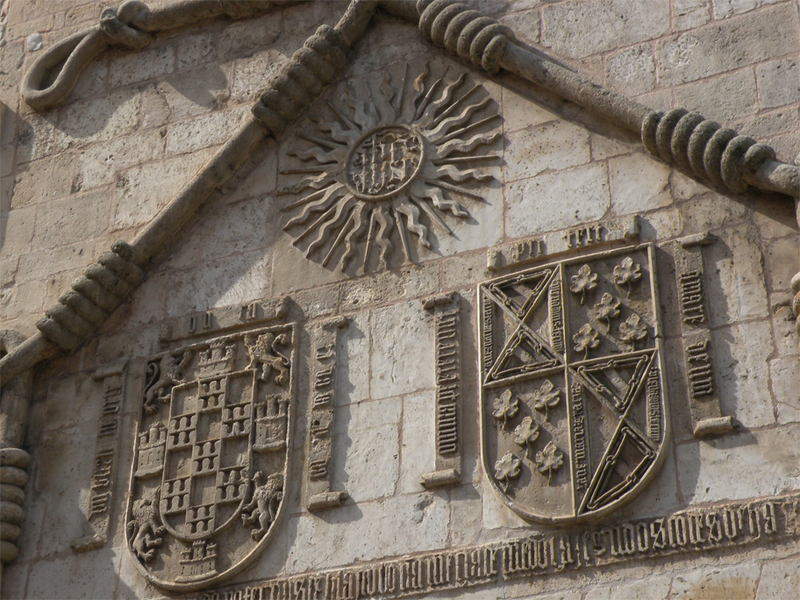 But El Cid continues to live on in the Spanish imagination… and in the bloodlines of modern-day European monarchs. Stunning pictures as always, James. And the carvings on the altar screen in the main chapel look amazing. By the way, I couldn’t help notice that on your trip through Spain, it looks as if you’ve had nothing but PERFECT weather. Lucky! Thanks, Andrew! 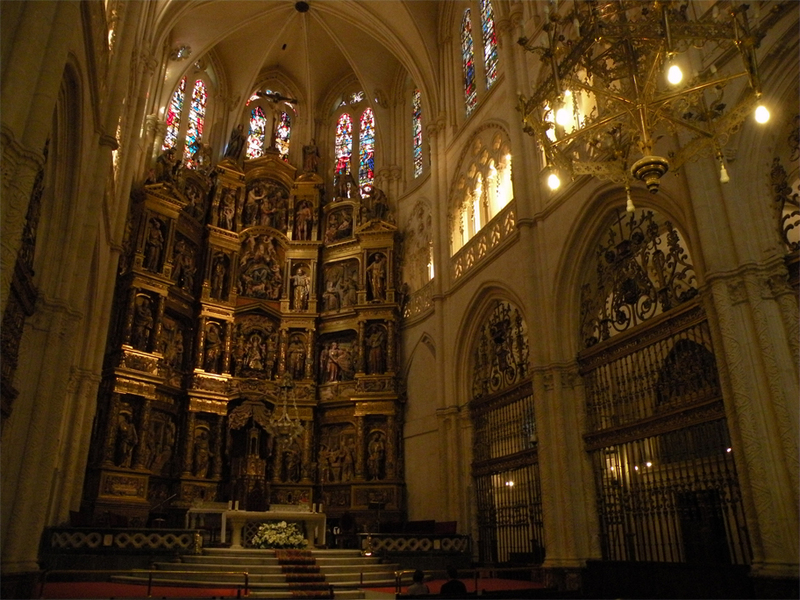 The level of detail on those altar screens – not to mention the walls of the cathedral itself – are simply mind-boggling. They look even better in person! I guess you could say we really lucked out, it was early summer and on almost every day we had no rain and clear blue skies. If only all history books were written like this, I wouldn’t have missed a lot. Again, another interesting history on Spain, James! And I was wondering where El Cid got his nickname. Now it makes more sense to me as sayyid is a word I’m more familiar with. Btw Andrew is right, in all of your pictures from Spain I can see blue skies and nice weather. Such a great write up with beautiful photos James! 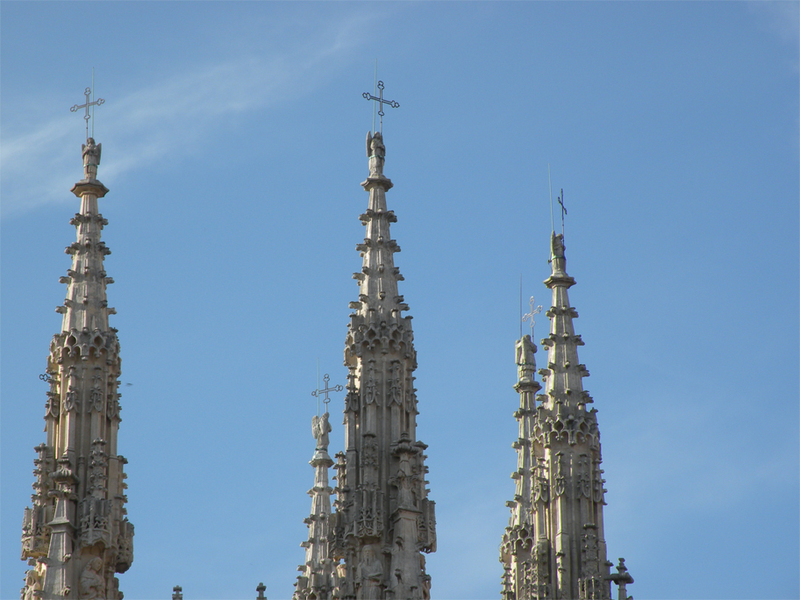 It’s my pleasure, Bama – I couldn’t write about Burgos without bringing up the legend of El Cid. The complex, historical approach may not suit everyone, but it does make for some interesting reading! Every travel post is better with a good story! Beautiful photos too. This brought back so many school memories! I studied it in my Spanish class. Very well written! A beautiful recap of the history and wonderful photos! I saw the movie El Cid years and years ago with Charlton Heston, Sofia Loren, and Raf Valone…those scenes running through my mind as I read your history. I know you are way to young to have seen that movie, but if you get a chance, I think you’d really enjoy it now. I haven’t seen the Charlton Heston film, but my mother certainly has! We were in Valencia one time and she couldn’t help bringing up the speech he made to its citizens. I must get around to watching that sometime – it really sounds like a classic Hollywood epic! 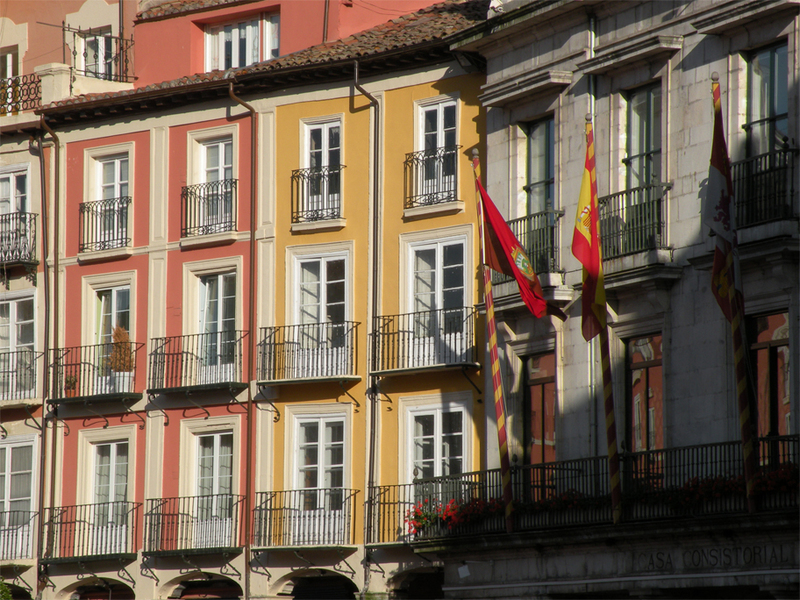 Thank you to let the world know how is Spain despite of its economical and political problems. De nada Marina, España es un país muy cerca a mi corazón. Estudié Castellano en Salamanca por nueve meses entre 2010 y 2011, y al final no quise irme… aunque viajé por muchas ciudades, especialmente en la Meseta y el norte, todavía falta un montón de lugares. Bueno, seguro que vuelvo otra vez algún día. Espero que estés disfrutando la vida en Canadá!